Reader Alert! Click the sidebar poll to let me know your thoughts on my spec screenplay A Nightmare on Elm Street 2: Freddy’s Return. This article was going to be a review of The Wolfman 2010 DVD. It was going to be a Re/Made compare and contrast against the original The Wolf Man 1941. However the former is so bad I refuse to waste time watching it to credits let alone writing about it. Like every independent blogger I don’t get paid for this. Read and see that there are no Google Ads on this site. Thrill Fiction is a labour of love for the genre and for writing. I would rather write about films I love though I will write about any that makes an effort. Previously on Thrill Fiction I’ve listed the top 20 films in over a hundred years of horror. The top 30 is to come. I’ve decided to concurrently review every film on the list in descending order. If you haven’t seen a given movie on this chart I’ll tell you why you should. If you don’t like a given film on this list I’ll tell you why I do. These reviews will be intermittent as I continue to script A Nightmare on Elm Street 2: Freddy’s Return. The reviews will be detailed. They may well influence you to take another look at a forgotten flicker in your childhood memory. They may invoke remembrance of the jolt of a first screening. I love these films. I love horror. So do you. United Kingdom: In 1988 Warner Home Video withdrew The Exorcist 1973 in anticipation of it being banned. The film would not receive certification for home viewing until 1999. During those banned years the film exploded in legend. 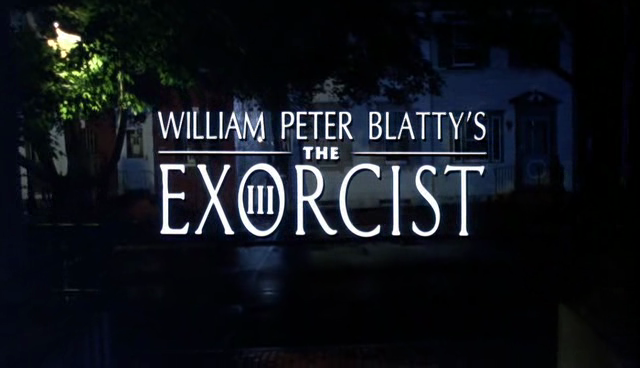 It was during those years that William Peter Blatty wrote and directed The Exorcist III 1990. The first sequel directed by John Boorman in 1977 has been dismissed (by Blatty himself amongst others). 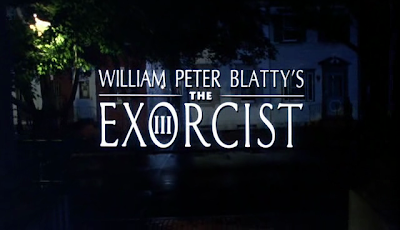 This film has been declared ‘the first true sequel to The Exorcist’. 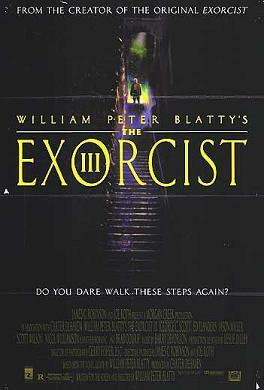 The Exorcist III is adapted from Blatty’s own novel Legion (pub.1983). The book itself became a quest for me during the 90s. It was out of print and no second-hand bookshop in Manchester or London stocked it or could order it for me. Then along came Amazon: problem solved. The film differs from the novel. The film is better. It is 15 years after Father Damien Karras threw himself to suicide down those steps and a serial killer begins his work in Georgetown. His work is copycat of an executed serial killer ‘The Gemini’. Lt Kinderman is led to an asylum where a lunatic claims responsibility. Patient X knows details about the Gemini killings that weren’t leaked to the press. He also knows details about one Reagan McNeil and an exorcism performed by Father Karras. He promises to help Kinderman’s unbelief. I am a Pentecostal Christian albeit lapsed. I believe. A college campus is an oasis of calm shielded from the fury of the world. It is an educated fool’s paradise. Blatty invokes the tranquillity of Georgetown University and provokes the spirit of the original film. The famous steps are introduced pre credit as are two of the main characters – Lt Kinderman and Father Dyer. Both characters were part-players in the original. In this film both characters are played by different actors. It didn’t bother me as it might have done – in 1990 I had not seen the original. Actors George C Scott and Ed Flanders respectively immediately command both roles as their own. This is acting that has to be witnessed. In a film full of great performances Brad Dourif delivers a searing cacophony to which Jason Miller is a symphony of malevolence. Scott and Flanders ground the picture while actors Scott Wilson and Nancy Fish imbue idiosyncratic impetus. Even the bit parts by Samuel L Jackson, Tyra Ferrell and Fabio have resonance. 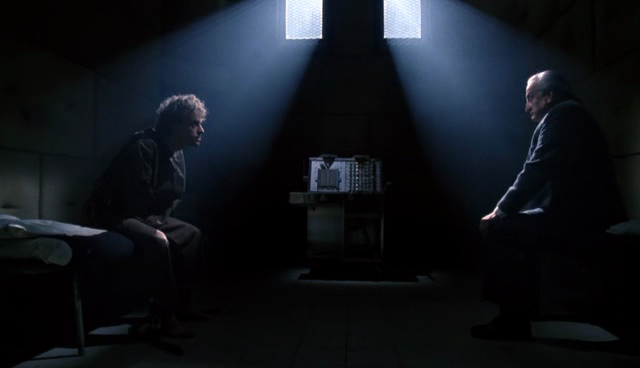 The dialogue is stylised almost to the point of film noir. It is at times pithy at others resplendent and at its best tsunami-like. This is the rage of a writer. The story unfolds at slow boil. As Kinderman connects the riddle of Reagan McNeil’s exorcism the serial killing continues. Urgency outpaces the characters – and the audience. The details of the set designs and locations are always in the foreground. Not only is there the sense of Georgetown but also of the hospital, Temple’s office and the Disturbed Ward. Blatty then uses the frame to magnificent perfection not only to invoke a sense of place but also a sense of doom. It is not often film of any genre casually addresses police racism as a matter of fact. This occurs at the first murder – that of an African-American boy. Kinderman uncovers a connection between the boy and Reagan McNeil. This film is a test of faith; why does God allow such evil upon his beloved? Lt Kinderman will face his fear. It will test his faith. The ending of the film is disputed and is the result of reshoots. The critic Mark Kermode denounces it whereas I applaud it. Not since The Wicker Man 1973 has a dénouement enrapt and engrossed in genuine terror. I went to see this picture three times in the spanking new multiplex – one of the first in England and the first in my city. Other than horror only comedy conjoins an audience. There is nothing comedic about the terror jolt from the hospital scene. It is unfailing. The audience has succumbed. Others have taken their appreciation further. It has now been adapted into a stage play. The Exorcist III is the best film I’ve ever seen never mind the best horror film.